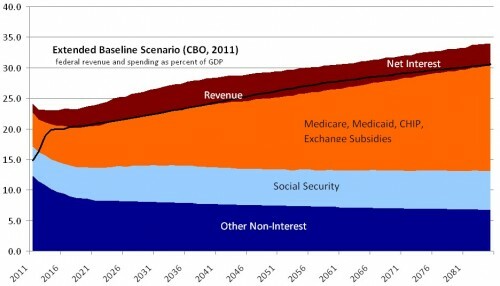 Last year I made some handy charts with CBO’s long-term budget outlook. In various ways they were better than the charts CBO made available. Judging from their popularity on the internet, I’d say people liked them. Here are updates of them using the 2011 projection. A key difference between these figures and last year’s is that CBO included a year-by-year long-term forecast of interest on the debt, which as far as I know they’ve never done before (and, I’ll add, is something that really annoyed me). So, these figures show both the primary budget (all non-interest spending) and the total budget (which includes interest spending). After the figures are my brief thoughts, all of which I’ve expressed before. Warning: the vertical scales on these figures are different. The extended baseline scenario is a forecast that strictly follows current law. The alternative fiscal scenario assumes some politically realistic deviations from current law, but that are clearly budget busters. Note how unimportant Social Security is in the long run (in that it is stable, not growing). Note how massively important health care spending is in the long run. Note how the alternative fiscal scenario flat-lines revenue at near the post-war historical average. 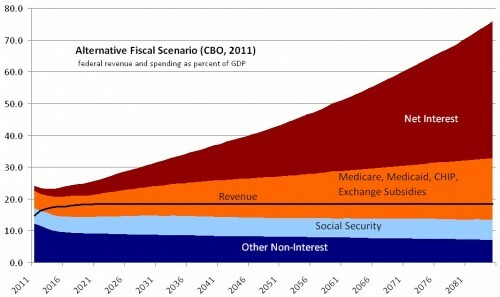 Finally, note the choice here: massive taxation or massive debt. A third way (not shown) is reduction in health care spending. As is implied by the above, controlling health costs is the most important domestic public policy issue for the next 50 years. UPDATE: Added the 7th item above, as suggested by Kevin Outterson. No. It’s the Cadillac tax plus bracket creep (Leonhardt showed this on Economix). Relative to historical trend, this is massive taxation in the sense of unprecedented levels of tax revenue relative to GDP (for the US). It’s not a value judgement on my part. “Massive” does not mean “wrong”. It means, well, “very large”. OK, the Cadillac Plan Tax hits 15-20% of companies that have been using additions to health car plans as an alternative to pay raises. A gradual phase in would allow companies to adjust the imbalance. I must admit, though, the bracket creep issue confuses me. If I’m married with a taxable income of $139K, I’m going to pay a marginal rate of 25%. If I get a raise to $140K, about ~$650 of that $1400K will be taxed at 28%, resulting in a $19.50 tax increase for that year…hardly a significant amount. Is this not correct? Best I can do: http://economix.blogs.nytimes.com/2011/04/12/imagining-the-end-of-the-bush-tax-cuts/ . You can ask there. You are indeed correct. The higher bracket only affects earnings above the threshold. Your observation #4 isn’t supported by the data in these charts. The healthcare spending is very, very similar in the two charts – both go from around 20% currently to just over 30%. The thing that is massively different between these two charts is the revenue line! The baseline goes quickly to 20% then gradually to 30%. The alternate goes to ~18% and then stays flat. The revenue difference then drives the massive spike in interest. I don’t disagree with your comments overall, but they aren’t very consistent with this chart. You’ve lost me. What’s growing in both charts independent of revenue? That’s what #4 is addressing. I stand by it, as, I think, the vast majority of readers, economists, and policy experts would. This is not controversial. RE point 6, “reduction in health care spending.” How exactly will you do that? I really don’t understand how anyone thinks you can just cut government medical expenses. Medicare is the most cost effective insurer in the USA right now. If you reduce medical government spending, you just transfer it to citizens, and you very likely increase the total spend. What does that solve? Why is it so bad to send our insurance bills to the government? I pay almost $2k per month to Emblem Health right now to insure 3 very health adults under 40. What would be so terrible about sending $1200 to Uncle Sam for better, cheaper health care? By all means, raise my taxes and take away my health insurance bill. No. Reduce relative to trend. As in, more efficient. Do you not think we can be more efficient? Not cost shifting, cost cutting. Judging by the rest of the world, and ourselves, the best way to reduce total spend on health care is to provide universal, government run health care. Obvious conclusion: medicare for all. What’s the blip at the beginning in revenue? Just the expiration of the Bush cuts? Increase in revenue due to economic recovery, I imagine. Simply going back to the Clinton tax rates would solve most of the deficit problem. And of course the GDP rose very nicely during the Clinton years whereas it stagnated in the time of the Bush tax cuts. The issue of containing health care costs can be addressed by Americans looking in the mirror. We are, by-and-large, overweight to obese, drink too much, abuse drugs, sedentary, use tobacco, et cetera. We also think that we can continue this life-style and somebody will give us a pill to make us all-better. Perhaps, but that pill is going to cost a lot. My understanding is that we are fatter then Europeans, but smoke more? Drink more? I don’t think so. More sedentary, more drug abuse? I don’t know.